With The People Who Now Control Johnny's Name. Johnny Always Played A Real Mosrite !! THE JOHNNY RAMONE LIMITED EDITION GUITARS ARE DISCONTINUED. There are still several available new & pre-owned in perfect condition. The Mark 1 64 Reissue is a bolt on model that resembles the Sidejack in every way except it has a bolt on neck. The Mark 1 Japanese Made 1963, 1964, & 1965 are no longer being imported into the USA. These guitars are every bit as good as the USA made ones but they cost considerably less. We expect to run out of these soon, Move quickly and you will save quite a bit of money. They all come equipped with the Vibramute System. They all have the trademarked Mosrite German carved body. They are virtually indistinguishable from the USA Mosrite. The Mark 1 USA Made 1966 Guitars are brand new for 2009. They all have the trademarked Mosrite German carved body. These cost less than the 65 Models They are made in the USA and intended to replace the Japanese models price point. These 1966 Models are almost exactly the same as the 65 model but offered for less money because the 65 model is considered the most collectible. These all sound just as good as the 65 model which is the most sought after one. This One Is The Least Collectable But The Best Price Point. The Gospel Solid Body Model. Very hard to get model if we could ever get any supply of these the price would probably drop. I am lucky to get one of these a year they are extremely collectable and many Christian players as well as Jimi Hendrix & Kurt Cobain Fans want them. The Mark II Junior These guitars come with 2 single coil pickups while the basses have 1 single coil pickup. Mosrite's least expensive guitar. The Mark II Johnny Ramone Forever Guitar, The most collectable of the Ramone models. Built right around the time Johnny died. This was the new photogenic model that he spent several years designing with Mosrite. Only 30 of them were made for the entire world counting Johnny's personal model. Johnny's favorite color was blue, he wanted the guitar to "Have a Lotta Bling" So he opted for blue jumbo metal-flake with gold hardware. Truly a handsome looking instrument. We have them in stock in fact none were ever shipped to any other dealers or distributors. These guitars were sold to celebrity fans & influential people in the music business. Call Ed Roman personally if you want one of these guitars. The Mark II Johnny Ramone Guitar, The Limited Edition that would not die, We sold over 250 of these guitars retail and many more to European distributors. Currently we have very few left in stock that can be purchased. WATCH OUT FOR FAKE MOSRITE GUITARS !!! Currently there are only 2 companies that are being copied more than Mosrite. These companies are Gibson & Fender. Usually as in the case of Mosrite & Fender the copies are cheaply put together Korean crap. In the case of Gibson I have seen at least 40 companies that are making better copies than the originals. Tokai, Madore, Navigator, Burny, Triggs, Dean I really hate to say it but Epiphones are built to a higher level of quality than many original Gibson guitars. The only thing wrong with the Epiphones are the basic designs are so old that they don't lend themselves to today's music. It's really easy to recreate Fenders & Gibsons because they use generic parts. The most popular models, which are the ones "The Ventures" played with the German Carve & Vibramute, They sell for about $1,595.00 to $3,495.00. Beware of cheap imitations with Bigsby tremolos or pseudo Fender tremolos. Wilson Brothers, Eastwood, Wosrite, Excellent, to name a few. The guitars that Semie's 4th wife Loretta Moseley is attempting to produce are a blight on Semie's product. The few that I have seen are atrocious and not at all worthy of being called a Mosrite. Dana Moseley Semie's daughter by his first wife is the one true keeper of the flame. Along with some assistance from us & Fillmore she has now been able to recreate the entire USA product line and is producing the best quality USA made Mosrite guitars that we have ever seen. Be extremely careful of the (Excellent Brand) The word "Excellent" is nothing more than a brand name. I have seen ads for Excellent Mosrite's which is a very misleading because it sounds like it's an Excellent Mosrite. In all actuality they might as well be called Acme Mosrites (Remember the word "Excellent" is nothing more than a brand name. It's the same scam that some Korean companies making guitars & calling them American. The word "American" is just a model name. They could have called it a "Mexican" or a "European" or a "Canadian" or a "Laplander" (This is just another scam to watch out for) You will see alot of this on FeeBay. 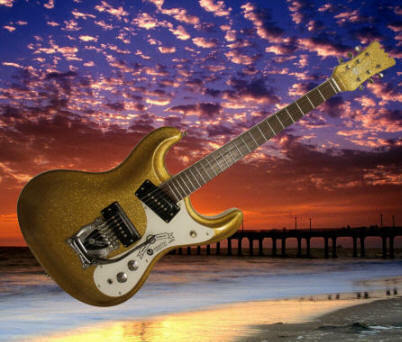 The second most popular model is the Mosrite JR 2 which is an exact replica of the guitar that Johnny Ramone played including all of Johnny's custom modifications. They are finally available for a lower cost. These guitars are built in the USA. The signature hand made models, only 2 available per month, sell for over $4,000.00. There is a 50th Anniversary Model available priced on request (only a few left). Johnny Ramone Models are discontinued and only a few left in stock.